The most disliked video (presumably) in the history of the Motor Trend YouTube channel. Are these really the overall ratings of the Motor Trend OnDemand to which we've been subscribed for the past few months? Our go-to distraction app, airport gate entertainment source, and automotive media happy place? We were incredulous. Motor Trend did the unthinkable though -- they suggested that YouTubers part with $4.99 of their monthly Mountain Dew budget to access (what seems like) bottomless automotive content. The free Motor Trend channel remains as active as it ever was with all of the same programming. The OnDemand subscription allows access to much of that content ahead of the YouTube release, as well as a wealth of other content that isn't available on the free YouTube channel. Seems fair enough really, but for this overtly capitalistic move ($4.99/month after a free 30 day trial!) Motor Trend has drawn the ire of freeloading users across multiple online mediums, and the overall OnDemand ratings reflect the collective outrage. Most of the criticism is baseless. If you're an automotive media junkie, we struggle to see how the OnDemand experience isn't well worth the nominal monthly fee. The OnDemand content goes far beyond what was ever available on their free YouTube channel, and as far as we know, exceeds the automotive content available on any other platform. 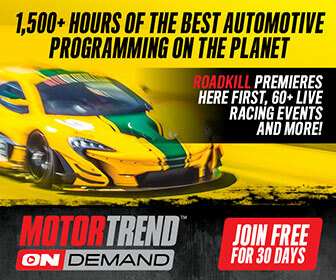 If you're into motorsports, for example, Motor Trend OnDemand has tons of it. Both library/archive material from years of F1, Indycar, 24 hours of Le Mans, World Rally, and others, as well as access to live qualifying and racing from series around the world. Perhaps our favorite OnDemand program is "Daily Fix," which is, we don't think it's inaccurate or unfair to say, unedited footage of car nerds being nerds in cars. Rather than the professional programming like "Ignition," "Head 2 Head," etc., Daily Fix is members of the Motor Trend crew ad libbing as they get to know a car, its handling characteristics, tires, etc. in a given context. ​"Behind the Wheel" is a similarly simple, and fun watch. It puts you in the driver's seat with Randy Pobst on hot laps. If you're into muscle cars and off-roading, there's a surplus of that content as well. Don't believe the negative hype! Motor Trend OnDemand is a quality product worth supporting.